Pizza Panini! That’s fun to say! When I traveled through Italy with my wife on our honeymoon panini’s were one of my favorite things to eat. I love sandwiches that are toasted on the outside and have lots of gooey stuff on the inside. I don’t have a panini maker at home so I typically make them like I would a grill cheese sandwich by frying them in a non-stick skillet. Not quite the same thing but still very tasty! 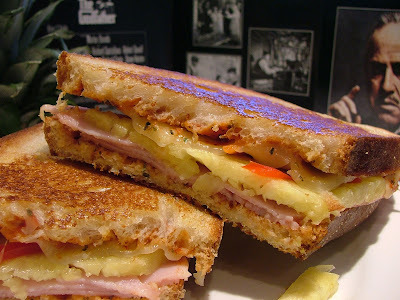 This Hawaiian Pizza Panini combines provolone cheese, rosemary ham, thinly sliced red bell peppers, fresh pineapple slices and pizza sauce. I used store bought garlic basil pizza sauce to spread on the bread and added dried oregano to the sauce to heighten the authentic flavor. I love paring crispy sandwiches with soup. I think this one would go nicely with a Tortellini and Vegetable soup. I had some fun making this easy dish listening to the songs from the movie The Godfather. I have to admit, when the theme song from the movie was playing in the background I sort of felt like a gangster preparing The Godfathers’s (a.k.a The Big Kahuna since this panini has a Hawaiian theme) sandwich. The back of the CD cover had a picture of Marlon Brando as the Godfather and his ominous stare made me a little a nervous. I’ve decided that picture is not allowed in my kitchen anymore. What do you think? Would the Godfather approve of this sandwich or would he summons his mafia heavies to whack me for adding Pineapple to a Panini? In a small bowl combine pizza sauce and oregano. Mix until combined. 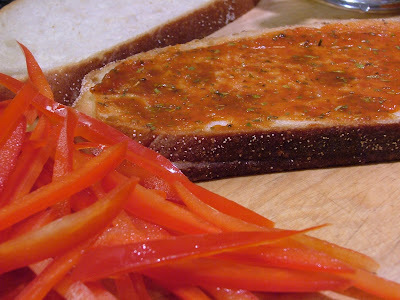 Brush one side of each bread slice with pizza sauce mixture. Top four of the slices with equals amounts of ham, pineapple slices, sliced red pepper and cheese. Lightly season with salt and pepper. Use remaining four slices of bread to top each sandwich. Using a pastry brush, brush outside of bread slices with oil and place in a panini press or nonstick skillet set over medium heat. Cook, turning once until bread is golden brown and crisp, about 2 to 3 minutes per side.